Remembered at RUNNYMEDE MEMORIAL, Surrey, UK. Panel 201. Aged 32. Son of Walter Percy and Annie Ortrude Coe. It appears Lawrence’s birth was registered in the first quarter of 1912. 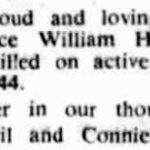 His parents were Annie Ortrude (nee Hoyle) and Walter Coe. His father was the Brandon headmaster from August 1921 until his death in February 1935, and it seems Lawrence was influenced by his father’s teaching. In July 1926, aged 14, Lawrence passed the Cambridge School Certificate Examination, meaning he could progress from the Brandon Foundation School to being a scholar at Thetford Grammar School. He also sat for final exams to enter London University. 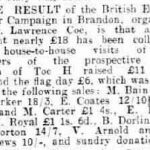 Lawrence’s father died from cancer in 1935 and Lawrence reacted to this by carrying out a door to door collection to raise funds for the British Empire Cancer Campaign (See image above). Assisted by Brandon’s TocH, he raised almost £18 of charitable donations from the town’s residents. So it seems Lawrence was still making his approach onto the dummy target, therefore he had not switched on his search light, and should not have been as low as he was. He has miscalculated his altitude. In September 1946 Lawrence’s mother, brother and sister-in-law put a remembrance in the Bury Free Press.